Our local TU Chapter along with Colorado and National Trout Unlimited is doing wonderful ongoing work in the defense of our rivers, and we're thankful that we are not alone in our struggle. One of our important allies in the fight to save our rivers is the Audubon society. While their focus is slightly different than the TU focus, our goals align closely. In addition, they have some excellent paid staff which enables them to more closely monitor and follow some issues that our volunteers in Grand County are unable to. The Audubon Society is a great organization which (unlike our local TU chapter) has paid staff to keep their website updated with the latest information and in-depth analysis. That's why you'll often find information blatantly stolen (with their permission) from their website on this website. From time to time, you'll also find links to newscasts about water from our partners in producing the documentary series, The Mighty Colorado River at Grand County TV18 as well as other electronic media sources. Here are some recent examples. Normally, you can make a secure donation to the Colorado River Headwaters Chapter of Trout Unlimited using your credit card or PayPal account directly by clicking the Donate button which will appear below again shortly. Unfortunately, for unknown reasons, PayPal suspended our account without notice and creating a new one takes a while for verification. We expect to have PayPal up and running again soon. Please note that if you try to use a credit card associated with your PayPal account you will be required to login to and use your PayPal account, not the credit card itself. Sorry...it's a little confusing, but that's the way PayPal works. You can also support us by becoming a member and attending our only annual fundraiser, our Banquet in July at Devil's Thumb Ranch. We also invite members to attend our monthly board meetings. They're usually held the second Wednesday of each month at the Crooked Creek Saloon in Fraser. Start time is 6PM. We're an environmental organization, but beer and fishing stories normally happen at our meetings! Check the calendar for details or contact a board member for more info. You can also find us on Instagram by clicking here! The Colorado River Headwaters Chapter of Trout Unlimited is located in beautiful Grand County Colorado. We are north-west of Denver and on the west side of the Continental Divide. We're located just where you'd expect based on our name: at the headwaters of the Colorado River. That means we're where the human population density is low and wildlife density (including fish) is high. Our moose count far exceeds our stoplight count. Grand County is roughly the size of the state of Delaware with a population of around 14,000. The main communities here are Winter Park, Fraser, Tabernash, Granby, Grand Lake, Hot Sulphur Springs, Parshall and Kremmling. We are fortunate to fish the Colorado and its first tributaries near their source, and the fishing here is wonderful. The mighty Colorado River (originally called the Grand River, hence, Grand County, Grand Junction, Grand Canyon, etc.) begins its journey here in Rocky Mountain National Park. Soon after leaving Rocky Mountain National Park the Colorado enters Colorado's largest and most beautiful natural lake, Grand Lake. From Grand Lake, it makes its way through Shadow Mountain Reservoir and Lake Granby. The first major tributary to the Colorado is the Fraser River, which joins the Colorado River near Granby. From Granby the Colorado heads through Hot Sulphur Springs, Byers Canyon and Kremmling before moving on towards Grand Junction and the Utah border on its way to the Pacific. As fishermen (and women) we find innumerable spots to find solace and wet a fly along the Colorado and Fraser Rivers here in Grand County. As members of Trout Unlimited, we care about our rivers and work to preserve the aquatic habitat required for fish to thrive. Colorado water law was written when it was still legal to buy a slave. That outdated approach to water enabled entities on the opposite side of the continental divide to buy the rights to most of the water in Grand County and send that water under the Continental Divide to the Front Range. In Colorado, water doesn't flow downhill...it flows to money. We don't have as much money or political clout as the Front Range so we know much of the water that was meant to be in rivers here will end up on Front Range lawns. Our TU chapter is dedicated to making the best of what's left. For example, we're working to turn the Fraser from a dying river to a healthy creek. Help us in our mission! Thanks to TU Board member Brad Johnson for the excellent photo to the right! In the spring of 2019, we're planning another willow harvesting and planting project along Ranch Creek near Tabernash. Tentative dates are Saturday, May 4, 2019 for harvesting and May 18 for planting. Stay tuned for details and sign-up information. The UN Climate Change Conference clearly stated that the rate of climate change is faster than anticipated. Listen to, or read the text, of an excellent and very informative fact-based interview on PBS. William Brangham interviewed David Victor, author of Global Warming Gridlockand professor of international relations at University of California, San Diego, on December 6, 2018. Click here for the link . The president of our local Trout Unlimited Chapter, Kirk Klancke, was interviewed for a feature story on Denver's Colorado Public Radio. Kirk and others discussed the importance of conservation in their voting decisions. You can read the text of the interview and see photos or listen to the audio by clicking here. Some feel that it will lead to more problems for the Fraser and upper Colorado. TU recognizes the Denver Water owns more water in Grand County than they are currently taking. We wish that weren't the case. We'd rather see more water stay here, but the current reality is that under the law Denver can take more water than they currently do. The MECP agreement is intended to deal with that reality and make the best of a bad situation. For the past eighty years, Denver has been diverting water from the Fraser with no accountability for the health of the river. If this project dies, we're convinced that the next eighty years will look like the last eighty. If MECP moves ahead, the diversion permit is tied to adaptive management. TU believes adaptive management builds in the accountability that will enable us to ensure the ongoing health of the Fraser. ​One critical component of our agreement with Denver Water is Learning By Doing. According to our Trout Unlimited representatives at these meetings (Kirk Klancke and Mely Whiting) the first few meetings have been productive and promising. The first step to protect and improve our streams is stream monitoring. At TU, we believe a science and fact based analysis of the challenges our rivers face is the first step to developing an effective plan of action. Learn what should be done, make a plan and only then implement the plan! One of the most important components of our cooperative agreement with Denver Water and Grand County is Learning By Doing. Fundamentally, Learning By Doing relies on careful observation and information gathering as the first step. The information is then analyzed and solutions are proposed to address problems in our rivers. The suggested steps to mitigate the problems are implemented and observation continues. How well did the mitigation work? Do we think we could do better? What can be done differently to improve the results? Let's try another approach instead or in addition to what we've already done because we think it will be better for the rivers. Trout Unlimited is an important player in the Learning By Doing process and much of our current fundraising is devoted to funding continued participation in the process by TU's excellent attorney, Mely Whiting. For the latest updates, click here. If you're interested in the health of our rivers in Colorado, you're probably aware that our state has implemented its first ever water plan. Like any document created in a politically charged environment, it is a product of compromise. It doesn't give TU and other environmental environmental organizations everything we would hope for, but it appears to be a positive step forward. Here's a link to Trout Unlimited's mostly positive take on the new agreement. Click here for a link to the YouTube video of the newscast. Our local Trout Unlimited Chapter debuted two new water-related films in the Middle Park High School auditorium on November 20, 2015. Thanks to all the interested folks who joined us despite the difficult weather and roads! We hope to have another similar event in the future. Here's a little information on the films we showed. The Great Divide is the most comprehensive and educating film about the history and uses of water in Colorado. This film takes the perplexing issues around water and states them in a way that everyone can understand and feel empowered to help make a difference in our water future. For more about the movie, click here. The Perfect Storm is a short film that tells the story of fighting for the rivers here in Grand County. A new website on water issues in Grand County debuted in October, 2015. Our friend (and TU board member) Anna at Colorado Headwaters Land Trust created it as part of her masters program. Check it out by clicking here for one more perspective. Click here for a link to the NPR radio essay about a water release which allowed water from the Colorado to reach the Pacific. Our third annual Family Fly Fishing event was again held at the beautiful Trail River Ranch inside Rocky Mountain National Park on Friday, July 31, 2015. Kids (and parents) learned the basics of fly fishing, the importance of water in the west and, best of all, caught some fish. To see the photos from the event, click here to go the photo album generously made available online by our friends at the Fraser River Valley Lions Club. Special thanks to our instructors from TU, Wayne Balnicki and Paul Hollrah, Bonnie Severson from Trail River Ranch and Jerry Nissen for organizing the event. You've seen the "Save The Fraser" bumper stickers around the Valley for years, and have been wonderfully supportive. The opportunity for you to participate actively in actually saving the Fraser has just gone to a new level. To learn what you can do, click here. Lake Mead relies on water from the Colorado to provide both water and electricity for Las Vegas and other parts of the southwest. Our ongoing 20-year drought has lowered the water level at Lake Mead to its lowest level since it was first filled from the Colorado 78 years ago. The drought, combined with the increasing demands will soon push the water level below the level at which the water driven electric turbines that produce electricity for Vegas will stop spinning. Vegas is building a new, lower intake (for $1.4 billion...yes billion, not million) to bring water from Lake Mead to Las Vegas for its municipal use. For an article with more details from the April 23 Las Vegas Review-Journal, click here. The PBS News Hour did an interesting report on our friends at American Rivers ranking of the Colorado River in the Grand Canyon as the most threatened river in the US. Follow this link to the video clip. American Rivers is also fighting commercial development in the Grand Canyon. To see their website and a petition to oppose that development, click here. The Sky Hi News ran an interesting article on April 17, 2015 discussing the impact and importance of the California drought to Grand County and the entire Colorado River basin. Everything is connected! To read the article, click here. The same paper had another article on Lake Granby. Click here for that article. It's been a fascinating start to 2014 along the Colorado River! Drought and climate change are the big news across the Southwest U.S., and 2014 looms as a year when we will see cutbacks in the flow of water out of Lake Powell but increases in the flow of water to the Colorado River Delta. Below, we provide you with two quick updates -- the first so that you can take action to protect the river; the second will maybe stir your sense of ethics about the future the Colorado River faces in a climate-changed world. First, when decision-makers do good work, we try to support and thank them. Alternatively, when they take actions that work against the health of our rivers, we also call them out. That's why we're asking you to help us reach out to decision-makers to stop the so-called "Water Rights Protection Act" that is moving through Congress. The Water Rights Protection Act is an anti-environmental, anti-government bill that will be moving to the floor of the U.S. House of Representatives in the near future. This bill was originally conceived to address a narrow conflict between the U.S. Forest Service and the National Ski Area Association about water used in snow-making at ski areas. Unfortunately, anti-environmental forces have seized on to the bill, greatly expanding its language and power. As it stands now, the bill would potentially gut the federal government's ability to protect America's rivers -- including the Colorado River -- on behalf of the American people. Our friends at National Geographic posted this blog about the bill -- please take a read of it here. Our additional friends at the national river protection organization, American Rivers, have created this action alert that allows you to contact your U.S. Representative and ask them to not support this bill. Please take a moment and click through to contact your representative. It is important to speak out and your voice will make a difference! water, and more drought. In this light, our friends at Grist.org have highlighted a story about a hedge fund manager who is specializing in buying Colorado River water rights in order to profit from the oncoming climate-change induced drought. Take a read of the Grist article here. This story not only brings up interesting questions about the privatization of water, but hones directly in on a question that will likely be more and more prevalent in the future: Is it ethical to profit from a disaster that imperils human access to life's most basic requirement, water? 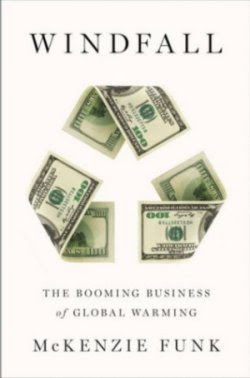 The Grist story discusses a new book, "Windfall: The Booming Business of Global Warming," by McKenzie Funk, in which many such ethical-profiteering situations across the planet are playing out. Human access to clean water has long been a serious problem in developing countries across the planet, but so far in the Southwest U.S. we have been very fortunate to almost always have access to clean, inexpensive water. Will that change in the future? Will your access to clean drinking water be controlled by hedge fund managers? And what about the health of the Colorado River in this escalating climate-change drama? Take a read of the Grist article here. Stay tuned for more information and action alerts about the Colorado River! The Colorado Water Plan website from Trout Unlimited has lots of great information about the development of the newly proposed Colorado Water Plan. Follow this link for details and more information. The ongoing drought -- which many scientists suggest may actually be the onset of "climate change" in the basin -- is expected to continue to be the top story and challenge in the Colorado River basin in 2014. 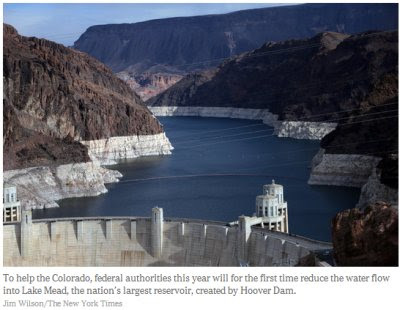 In fact, on Monday January 6th, the New York Times' front page story was titled: "Colorado River Drought Forces A Painful Reckoning For The States." Click through and read it. As we have noted in past emails to you, and through our social media channels, the water levels in Lakes Mead and Powell continue to drop with no end in sight, the demands on the river continue to increase with no end in sight, and drought/climate problem continues to escalate. A day of reckoning is very, very likely approaching -- the plumbing system on the Colorado River is no longer sustainable for water supply delivery, let alone for any semblense of a healthy river. To drive this point home, a very prominent White House news correspondent, Paul Brandus, who has nearly 200,000 twitter followers posted a story on New Year's Day titled, "5 Things You Should Worry About In 2014" one of which was "Our Shrinking Water Supply" on the Colorado River. Read it here. Even more bad news on the same topic: In March of 2014, the Intergovernmental Panel on Climate Change (IPCC) is going to release its "regional reports" which will predict how climate change will impact specific regions of the earth. Images that have been made public show predictions for increased drought and drying throughout the Southwest U.S. 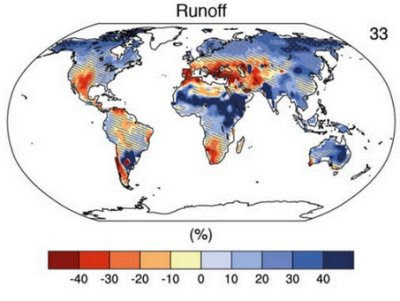 These predictions from the IPCC correlate strongly with all other climate modeling that has been done by American scientists and water providers throughout the Colorado River basin. Yes, we may have wet years here and there, and we can even still have biblical floods, but the prognosis is that drought is likely to be permanent. In December of 2013 at the Colorado River Water Users Association meeting, Secretary of Interior Sally Jewell called this the "new normal" on the Colorado River. Now for a little good news! 2014 is very likely to be the year when we see the governments of the United States and Mexico collaborate on releasing water out of Morales Dam on the border and down into the Colorado River Delta. Scientists are now working to create a "pulse flow" release from the dam to give a short-term flood into the dried-up river bed. Recall, the Colorado River no longer reaches the Gulf of California -- all 5 trillion gallons are drained out every year by cities and farms in the U.S. and Mexico. In 2012, the two countries reached a historic agreement to put some water back in the river, and now in 2014 we are going to see the outcome of that agreement. It will be a historic day to see water released from this dam. Save The Colorado will be following the story closely (and maybe we'll be in a raft at the bottom of the dam?!) and keeping you posted. 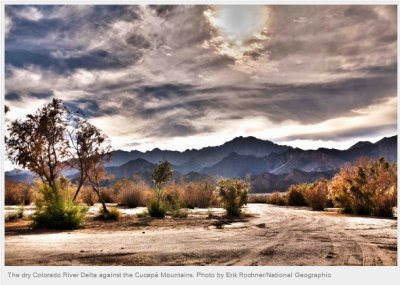 Check out this news article, "Man-made Flood Could Help Revive Colorado River Wetlands," posted on Livescience.com and this National Geographic post, "Scientists Plan For Grand Experiment In The Colorado River Delta" by Sandra Postel. 2014 will also offer lots of stories in the state of Colorado around the Governor's "Colorado Water Plan," and around several dam and reservoir projects moving through permitting processes in the Denver area. 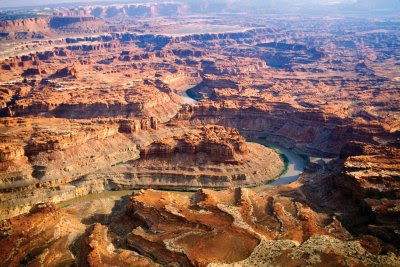 In addition, Utah is still a hotbed of river chaos with proposed projects and a "State Water Plan" also in the works. Finally, Southern California has faced the worst 1-year drought in history in 2013 causing the region to rethink and rework its water supply system. We will cover all of these stories and more and let you know how to help and take action. Stay tuned for more updates and action items! It's going to be an exciting year on the Colorado River! Watch films of a journey down the Colorado River from the beginnings at Lake Powell in the Rocky Mountain National Park to Lake Powell in Utah. It will be presented in 5 installments and the first takes place in Grand County. Local residents are interviewed along the way and a story unfolds about the problems facing this great river system. The entire series is being aired on Grand County TV18 as part of TU's The Mighty Colorado River series. We've got plenty of water for boating and fishing across the C-BT. Granby is seeing some balance between inflows and outflows and is staying fairly steady at roughly 70% full. We and Northern Water are releasing around 75 cfs--the Y gage is showing about that and that is not expected to change during July. Shadow Mountain is about 94% full. Lake Estes is at typical water elevations for this time of year, around 80% full. We are seeing the tail end of run-off on the Big Thompson River and are moving some project water through the reservoir for power generation. We are releasing about 125 cfs from Olympus Dam on Lake Estes down through the Big T canyon. That shouldn't change much through the weekend. Pinewood Reservoir continues to fluctuate at a typical rate for this time of year. We are generating hydro-power as the reservoir is between two plants. In fact, for the first time in several years we are at full generation capacity at the Flatiron Power Plant down below. We are running all three units: generating electricity with two and pumping up to Carter with the third. Carter Lake is seeing the highest draw for the season so far. We turned the pump to Carter back on last week and will continue to pump for a couple weeks to come. Still, Carter is about 75% full. Horsetooth has been the most static so far this summer. The water level elevation has been around 5414 for well over a month. With the pump on to Carter, and demands up on the Big Thompson River at the canyon mouth, we are sending less into Horsetooth, but not much has come out yet, so far. As a result, Horsetooth remains around 80% full. The Audubon Society started a Western Rivers Action Newsletter in the spring of 2013. Click here to check it out. Last year’s banquet was on Monday, July 16th and again it was at the spectacular Devil’s Thumb Resort. Great live and silent auction items, excellent food and drink, the views of the Indian Peaks Range, some much needed rain, and the chance to socialize with others that want to protect and preserve our Colorado Headwaters helped make the event a success. Thanks to your support we raised about $15,000. For more information, click here. Local TU representatives, Governor Hickenlooper, County Commissioners and others were at the signing of the Colorado River Cooperative agreement at the Commissioner's meeting room in Hot Sulphur Springs at noon. This agreement is a compromise between Grand County and Front Range water districts that represents one step toward preserving our rivers. For a bullet point list of the agreement's highlights, click here. For more detailed information, click here. Several convservation groups may work together to help temporarily increase some stream flows. Follow this link to the Denver Post article. Best Article Yet on the Colorado's Plight! On Sunday, April 8, 2012 the Denver Post ran a superb article titled "Sucking the River Dry". Click here to read the article. The dedication of the newly-designated Eisenhower Reach of the Fraser River was on Saturday, July 14 at the Lions Ponds near Safeway in Fraser. Photos are available in our Gallery. Scroll below the large photo of the original sculpture dedication and click on the album for the Fraser Reach. The text of Mayor Peggy Smith's informative talk (written by Steve Sumerall) about President Eisenhower in the Fraser Valley is available here. TU held a rally Thursday, January 26 outside the EPA offices in downtown Denver. Perhaps that rally and Mely Whiting's article helped remind the EPA that the de-watering of the Colorado Headwaters is an important issue. On February 17, the Denver Post ran a front page article about the damage to our watersheds likely to result from additional trans-basin water diversions. The EPA has requested additional review of the Moffat and Windy Gap proposals. Please read the article and follow up with letters phone calls and emails to Governor Hickenloper, the EPA your elected representatives, your friends on the Front Range and anybody else willing to listen! To read the Colorado TU blog posts about this event, click here. The Colorado Headwaters Anglers Club is hosting it's second annual Kids Fishing Rod Drive. They need spincast, flyrods, baitcast, ice fishing rods, tackle and tackle boxes. Budget Tackle is restringing reel with new line and the gear will distributed by the Mountain Family Center. Gear can be dropped off at City Market, Budget Tackle and Country Ace Hardware all in Granby. Look for the Big Boxes. Check through your closets and see if you don't have something that could be useful for this group! On the Rise will air exclusively on the Sportsman Channel four times a week: Saturdays at 2 p.m., Fridays at 4:30 p.m., Thursdays at 6:30 a.m. and Tuesdays at 3 a.m.* Host Jed Fiebelkorn takes viewers on an adventure-filled journey to some of the best trout and salmon fishing locations in the United States. Reaping the rewards of Trout Unlimited's hard work and shining a spotlight on the critical issues facing America's trout water, Jed takes viewers to places many anglers only dream of going. The season starts out in Alaska's Tongass National Forest—one of the most wild places in the country, where huge salmon and severe weather prove to be quite a challenge. Next, the show moves to the majestic mountains of North Carolina, where wild brook trout in tiny streams require a nimble cast and a light touch. From there, Jed and his arsenal of fly rods head to the famed waters of Idaho's Silver Creek, hike the Hawaiian jungles in search of trout and stalk big rainbows in Pennsylvania spring creeks—all while bringing to life the conservation work of Trout Unlimited volunteers. Read about the full list of 2012 episodes here. Sportsman Channel is available in HD on DISH on channel 9483, SD channel 285; also on DIRECTV channel 605. Check with your local cable or satellite provider for further information. The great thing about winter fishing is that the fish are pre-frozen. Trout Unlimited publishes a marvelous national newsletter. Click here to view it online.